Charlottenburg’s Kantstraße is known in Berlin for its many Southeast Asian restaurants, and Madame Ngo is no exception. 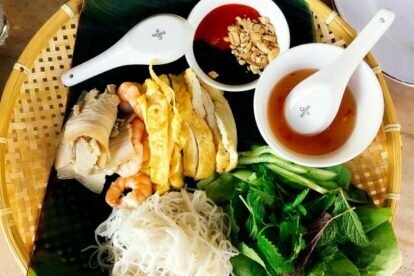 What makes it unique is its food concept – a combination of Vietnamese soup kitchen and French brasserie, something the owner Duc Ngo has described as homage to his birthplace Hanoi. I find the interior very pleasant with lots of wood and green plants, and on sunny days you can sit outside to soak up the sun. The dish that everything revolves around here and that I can wholeheartedly recommend is Pho, the Vietnamese noodle soup. It is served with all sorts of extra ingredients, such as chicken, beef or meatballs, vegetables or tofu. As a starter I would recommend you pick the incredibly crunchy spring rolls, filled with mushrooms, carrots, herbs, lettuce, tofu and a fish sauce vinaigrette. And how about a very French tarte tatin for dessert? If that is not yet enticing enough, have a look at their menu of the day. When I was there last I had the summer roll platter in the picture, which was basically a basket full of fresh ingredients and several sheets of rice paper to roll them up with, DIY-style!